Josquin des Prez, also spelled Desprez, des Prés, or Després (born c. 1450, Condé-sur-l’Escaut?, Burgundian Hainaut [France]—died Aug 27, 1521, Condé-sur-l’Escaut), one of the greatest composers of Renaissance Europe. 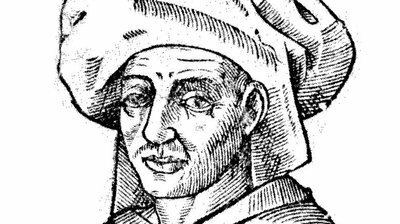 In an era when music was generally performed a few times before being replaced by something newer, Josquin des Prez was a rarity: a composer who was remembered and honored long after his death. Throughout the sixteenth century, his works were cited in theoretical treatises and extensively quoted in the music of other composers. In 1538, seventeen years after Josquin died, Martin Luther extolled him as “the master of the notes, which must do as he wishes, while other composers must follow what the notes dictate.” Even in the seventeenth and eighteenth centuries, Josquin’s music was not entirely forgotten, while the nineteenth century saw him acclaimed (alongside Palestrina) as one of the two greatest composers of the Renaissance. Josquin’s early life has been the subject of much scholarly debate, and the first solid evidence of his work comes from a roll of musicians associated with the cathedral in Cambrai in the early 1470s. During the late 1470s and early ’80s, he sang for the courts of René I of Anjou and Duke Galeazzo Maria Sforza of Milan, and from 1486 to about 1494 he performed for the papal chapel. Sometime between then and 1499, when he became choirmaster to Duke Ercole I of Ferrara, he apparently had connections with the Chapel Royal of Louis XII of France and with the Cathedral of Cambrai. In Ferrara he wrote, in honour of his employer, the mass Hercules Dux Ferrariae, and his motet Miserere was composed at the duke’s request. He seems to have left Ferrara on the death of the duke in 1505 and later became provost of the collegiate church of Notre Dame in Condé. Josquin was particularly adept at the canon, or a composition of overlapping vocals. If you have ever sung Row, Row, Row Your Boat as a round, you have sung a canon. A canon can utilize one voice or as many as four or five voices, and as the strictest form of polyphony, it requires great skill on the part of the composer. The motet, Ave Maria, gratia plena, is an excellent example of canonic writing with the four voices overlapping each other in perfect imitation, one after the other. In some of his masses, Josquin employed an older style known as the cantus firmus, an existing melody composers used as a basis for a composition. For instance, Missa Fortuna desperata is a cantus firmus mass that uses the polyphonic song Fortuna desperata as its musical foundation. Josquin also composed parody or paraphrase masses, which became increasingly popular during his life and eventually replaced the cantus firmus style. A parody or paraphrase mass transforms an existing melody by breaking it into sections and scattering it throughout the composition, mostly by using different voices. For example, Missa Pange lingua is a paraphrase mass that Josquin composed in approximately 1515. It was also his last mass. The cause of Josquin’s death, on August 27, 1521 remains unknown; but his end seems to have been expected, since, a few days earlier Josquin established his will in the presence of the mayor of Condé and other witnesses. The law of the time stated that a lord could claim rights over the property of the inhabitants of his fief when they died, unless they paid a tax, which Josquin did on this occasion. He was then able to request that his possessions be given to the church’s chapter. After Josquin’s death, the chapter paid him homage through a regular commemorative service, endowed by the sale of his house. On this house was attached an image of the Virgin Mary, and it remained customary during processions to pause by the house, face the image, and sing Josquin’s settings of the Ave Maria and Pater Noster. Him who gives them his paradise.